ché la diritta via era smaritta..."
That is, of course, the opening of Dante's Divina Commedia. It is one of the most famous passages in all literature and if you still remember it, you don't need me to tell you what a gentleperson and scholar you are. You also don't need me to point out to you the exquisite uselessness of that passage—in spite of the fact that it mentions being lost—when you're trying to find the main train station in Naples, for then you may find yourself having to deal with so-called 'non-standard' Italian, a dialect. In Naples you are surrounded by the sounds of an ancient and rich, bawdy and colorful language, one of the most interesting tongues still wagging anywhere in Italy and one which to the ears of puzzled newcomers seems to have only peripherally to do with the national language. Discussions of language bog down in questions of "language" vs. "dialect". It's like the difference between "cult" and "religion". A religion is a cult with political power, and similarly, as Latin splintered along with the Roman Empire, the pieces—dialects—became "real" languages when the people who spoke that particular brand of vulgate Latin got enough clout to declare that theirs was the official language of the area they lived in. The reason we have Spanish, Portuguese, Italian and French is that we first had Spain, Portugal, Italy and France. Until the unification of Italy in the last century the Latin "splinter" spoken in Naples was the language of the Kingdom of Naples; (thus, the "Neapolitan language" is named for the old kingdom of Naples and not just the city of Naples). When Naples became part of the Kingdom of Italy (1861), the language was relegated to being "just" a dialect, because the new official language of united Italy was based, for various literary, historical and political reasons on Tuscan, the central Italian dialect of Dante. 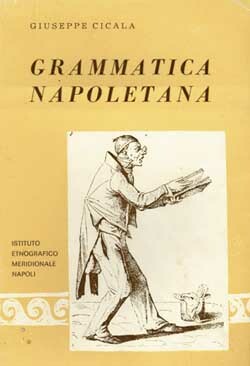 Typical Neapolitan expressions are: "Tiene 'a capa sulo per spartere 'e rrecchie!" Roughly: "The only thing your head is good for is to keep your ears apart!" or "Storta va, deritta vene," (it leaves crooked and comes back straight), the sense of which is that "Each cloud has a silver lining," and "Chiacchiere e tabacchere 'e lignamme nun s' mpegnano—literally: "You can't pawn talk and wooden snuff boxes", meaning, "Talk is cheap." Neapolitan has Latinisms long since gone out of standard Italian, such as mo' for "now" (from the Latin modum ). It has influences from Spanish, such as cu mico and cu tico, instead of the Italian con me and con te. It has words such as sfizio, for which there is no Italian equivalent, and which has found its way into use in standard Italian. Sfizio is the satisfaction one gets from doing something "just for the hell of it". In the outlying areas near Naples, they still have words such as craje, for "tomorrow"—a word that came ashore with Ulysses. That there is Greek in Neapolitan shouldn't be surprising, since Naples was a Greek colony before Romulus had even learned how to spell "empire". 'Napoli' comes from Neapolis—"new city"—and other place names, less obvious, are abundant: 'Posillipo' is from Pavsillipon, Greek for "the place where unhappiness ends." Phonetically, Neapolitan is very interesting. One of the most obvious sounds is what phoneticians call the "schwa", a neutral, central vowel, the "uh" sound of unaccented syllables in many languages: English, Russian, Neapolitan (but not Italian)—the 'a' in 'ago', for example. A dead giveaway that a northern Italian is trying to sing 'O Sole Mio is the mispronunciation of the final vowels as pure Italian 'ay' and 'oh,' instead of 'uh' and 'uh'. It is the most characteristic of all sounds in Neapolitan. There are even Neapolitan vowels and consonants traceable to the languages of the pre-Roman peoples of Campania, the Oscans and the Samnites. We forget that before Latin in this area, there was Greek, and before and alongside Greek there were other local languages, none of which have survived. Latin met with more resistance in Campania than elsewhere on the peninsula as the Empire spread out from Rome. Even back then, people in this neck of the woods were stubborn. The Roman historian Livius reports that a delegation from Cuma had to go all the way to Rome in 180 BC and have Latin declared the official language down here in order to get the folks in the local markets to stop speaking Oscan! Even then, it was noted, the people in this area still pronounced Latin with a local accent. Among the many grammatical peculiarities of Neapolitan is the post-positioning of some possessives with family members. "A sorete" (to sister-yours) as a return insult, means roughly: "The same goes for your sister, buddy!" The proper pronunciation of the final vowel as "uh" (see above) also qualifies you for participation in the ancient and stirring ritual of The Laying On Of Fists. Neapolitan has survived and thrived magnificently as a vehicle of expression for such Neapolitan greats as the playwright/ philosopher Eduardo de Filippo and the poet/clown Totò, both of whom, in their own inimitable ways, are the essence of Napolitanità—the ability of the common people to retain their dignity in the face of adversity, to resist being overwhelmed by external forces. This applies to language, as well—maybe especially language, whether it's Oscan, Greek, Latin, Spanish, French or, recently, English. Resist, change it, make it your own, but don't be overwhelmed. Don't give in. pecché m'ero 'mbriacato senza vino. Those are, again, the opening lines of La Divina Commedia but this time from a translation in Neapolitan. How's that for not giving in?! [Most people know a little bit of Neapolitan dialect from famous Neapolitan songs such as 'O Sole Mio. To read about the Neapolitan Song, click here. To view some of the texts of the songs themselves, in dialect, and listen to them being sung, click here.